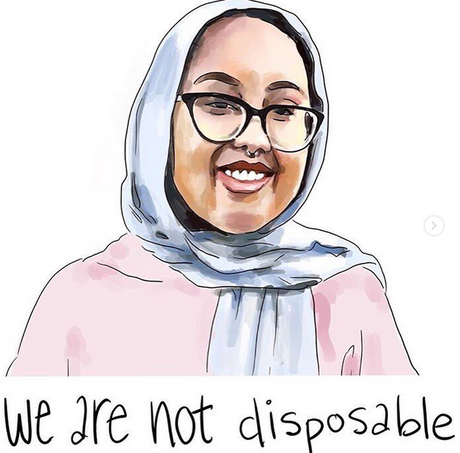 This past week, a teenage girl identified as Nabra Hassanen was brutally murdered. She was attacked on her way home—assaulted by a man with a gun, beaten with a metal bat, and discarded into a body of water. Before she was attacked, Hassanen was leaving her mosque, a Muslim place of worship, during the week of Ramadan, and wearing her hijab. What should be mundane details about this young women instead suggest that Nabra’s murder was a hate crime and that her perpetrator’s actions and beliefs were rooted in sheer ignorance and resentment. In this particular, tragic instance, one Muslim girl was killed. But this crime is bigger than Hassanen alone: it is a threat to an entire religion, particularly its women. Muslim girls and women have long been essentially invisible to most people in the Western world, particularly America. We have never been properly represented in the media as a people. I’ve mostly seen men painted as villains, as perpetrators of violence, on the evening news. I rarely see Muslim women who look like me represented in the media at all. When we do exist, we do so at the hands of white Americans—we are molded into ammunition against the religion of Islam. These ignorant statements are said by people who I highly doubt are well read in the Qur’an. They draw assumptions about a religion my community holds close to its hearts from superficial differences between Muslims and non-Muslims. They try to deflate the entire philosophy of their religion by villainizing Islam and then, hypocritically, objectifying Muslim women as victims. They debase the way one billion Muslims find solace, then toss us aside when we are no longer convenient to their argument about religion and violence, when we are no longer useful as anything other than the objects of misdirected anger. Muslim women are regarded by Western society in a particularly ironic way: we are considered oppressed by our religion, and yet are in turn oppressed for our religion. If the West was truly concerned about Muslim women, then we would not be targets of violence here, too. But we are: similar stories to Nabra’s have unfortunately been enacted too many times. This past year alone has had its plethora of hate crimes against Muslim women. A Muslim student’s purse was stolen by two men who grunted racist comments at her. In the aftermath of the recent London attack, Muslim women unassociated with the attack were choked outside of their mosques by strangers. Multiple women have reported being spat at and having their hijabs (headscarves) torn off of them. And the thing that proves non-Muslims truly don’t care about Muslim women is how little these stories have made headlines in the news. Media is important. It generates public emotion by subconsciously telling its consumers who among them deserves empathy. Since Muslim women don’t exist in the media, it’s hard for Americans to empathize with them. Muslim women are known only as the sisters, wives, and mothers of “terrorists,” bystanders of our religion’s alleged terrorist agenda, and beings subjugated by our religion’s “sexist” and “restrictive” values. It is more important now than ever to strive to humanize everyone in our nation. One way to do this is by giving all Americans accurate and equal representation in the media, whether that’s through the way they are covered in the news, or by hiring more diverse creators of and performers in creative media. Muslim Americans don’t deserve to fear walking down the street. We don’t deserve to fear disappearing. We deserve to exist. Nabra deserved to exist.